Divers rejoice! The approximately 3 million divers who travel abroad for a diving vacation will thrill to the new print and online publication called Blue Caribbean, which focuses exclusively on diving in the Caribbean. Blue is the first print and online magazine focused exclusively on diving and ecotourism dive attractions in the Caribbean. Barbados will be featured in the March 2011 issue. The photos on the site are eye candy for diving enthusiasts as well as regular folks like me who are fascinated by the exotic world beneath the sparkling blue Caribbean Sea. The cover of the debut issue of Blue Caribbean magazine. The magazine will be distributed in North America, UK and throughout the Caribbean, showcasing the region’s most alluring dive destinations, blending culture and other activities related to nature or water. In the current issue, the drama of Dominica’s volcanoes above and below the water makes for a lively read of culture, history, topography, and life above and below the water line with photos that bring the diving experience alive. 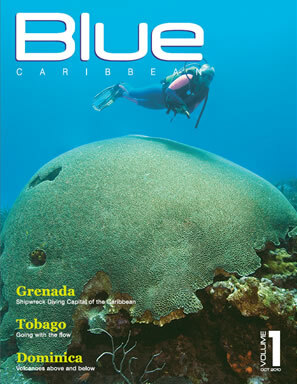 This issue also features diving in Tobago and Grenada. Each issue features at least three destinations, exploring not only the dive sites but also other aspects of ecotourism and indigenous culture, taking readers off the well-trodden path. The magazine explores the mainstay of the countries’ economies and includes general tourist information and destination maps. The “Postcards” section captivates readers with exquisite land-based scenery and wildlife. I am asked fairly often about diving in Barbados and warmly welcome the debut of Blue Caribbean magazine and wish it much success. Blue Caribbean is available online at http://www.bluecaribbeanmag.com. Take a look and marvel at a world as exotic as exists anywhere in nature.